Total Socials: Pinterest Versus Instagram: Which One is Better? It is no wonder visual social platforms like Pinterest and Instagram are on fire with brands and consumers. The human brain likes visuals. 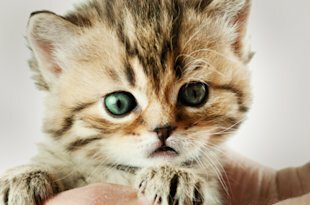 People process images 60,000 times faster than text and 90 per cent of information transmitted to the brain is visually based. If your brand or business wants to get in on the photo sharing action, but does not have the bandwidth to participate on both Pinterest and Instagram, how do you decide between the two? It all comes down to your target audience. What is the difference between Pinterest versus Instagram? 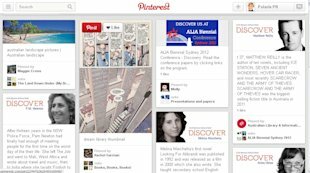 Pinterest is a virtual bulletin board that lets users share inspiring images and links. When shared the images are called “pins” that can be placed on thematic “boards” that users customize for any topic. Pinterest is all about curating images. Instagram, on the other hand, is a free iPhone and Android photo sharing application that lets users share photos with their friends. Once users take photos, they select filters to add flair to their images. Instagram is the ideal tool to transform boring photos into works of art. Instagram is all aboutcreating images. Pinterest is the fastest growing social media network ever, currently weighing in with 70 million users. According to research from The Social Habit and a study conducted by the Pew Research Center’s Internet & American Life Project in late 2012, Pinterest users are predominantly female. In fact, women account for 70 per cent of Pinterest users and are about five times as likely to use the virtual scrapbooking tool as men, the largest gender difference of any social network in the Pew research report. 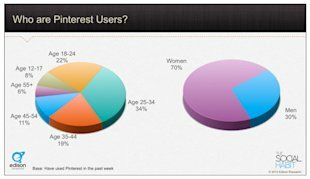 Pinterest users also tend to skew a little bit older, although the core demographic is 18-34 year olds, representing 56 per cent of users. Instagram has 130 million active, monthly userswith 50 per cent of them outside the United States. They share 45 million photos and “like” 1 billion photos PER DAY. 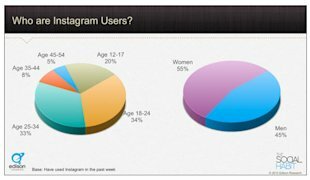 Compared with Pinterest, men and women are more evenly represented on Instagram, although the application skews female (55 per cent of users). This network is more popular with the younger crowd—two-thirds or 67 per cent are between the ages of 18 and 34. Popularity drops dramatically with the older demographic. Both Pinterest and Instagram provide an opportunity for brands to engage with people using images, including video. Visual content creates an emotional connection with your audiences—employees, customers, partners and suppliers—and provides them with more insight into your organization. Last November, Instagram profiles launched, giving marketers a way to market with Instagram not just on iPhones and Androids, but on devices other than mobile. And Instagram profiles are not just for consumer brands like Nike. 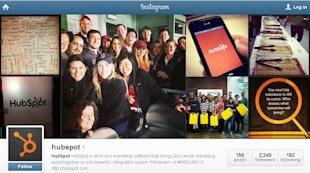 B2B marketers such as HubSpot are also participating to reach a wider audience. 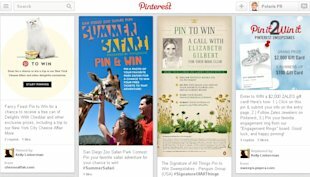 Pin to win contests are popular on Pinterest where brands invite followers to pin their favourite images to win trips, cruises, tickets—even a phone call with author Elizabeth Gilbert for their book club. Photo contests are easy to execute on Instagram. Just ask followers to tag photos with a hash tag, making it easy to find entries and pick a winner. 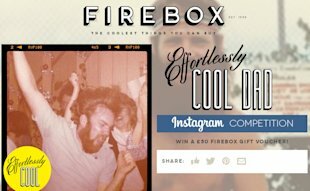 Firebox, an online UK retailer selling quirky gadgets, toys and games, celebrated Father’s Day with the Effortlessly Cool Dad Instagram Competition, inviting people to upload a picture of their father figure for a chance to win a £50 Firebox Gift Voucher. Pinterest and Instagram are both useful tools to promote upcoming trade shows, conferences or other events. Use photos or video from past and upcoming events, include images of the city where the event is held, recognize suppliers and partners, post images from blogs or other publications about the event topic, profile speakers and post white papers. If your business needs to decide between the two platforms, the bottom line is your audience. Are they more likely to curate (Pinterest) or create images (Instagram)? Are you targeting a younger demographic (Instagram) or an older, female group (Pinterest)?